The Kafka producer will retrieve user input from the console and send each new line as a message to a Kafka server. The consumer will retrieve messages for a given topic and print them to the console. The producer and consumer components in this case are your own implementations of kafka-console-producer.sh and kafka-console-consumer.sh. Let’s start by creating a Producer.java class. This client class contains logic to read user input from the console and send that input as a message to the Kafka server. Next we’ll create a simple consumer that subscribes to a topic. Writing the consumer code in Listing 2 in two parts ensures that we close the Consumer object before exiting. I’ll describe each class in turn. First, ConsumerThread is an inner class that takes a topic name and group name as its arguments. In the run() method it creates a KafkaConsumer object, with appropriate properties. It subscribes to the topic that was passed as an argument in the constructor, by calling the kafkaConsumer.subscribe() method, then polls the Kafka server every 100 milliseconds to check if there are any new messages in the topic. It will iterate through the list of any new messages and print them to the console. In the Consumer class we create a new object of ConsumerThread and start it in a different thread. The ConsumerThead starts an infinite loop and keeps polling the topic for new messages. Meanwhile in the Consumer class, the main thread waits for a user to enter exit on the console. Once a user enters exit, it calls the KafkaConsumer.wakeup() method, causing the KafkaConsumer to stop polling for new messages and throw a WakeupException. We can then close the KafkaConsumer gracefully, by calling kafkaConsumer‘s close() method. Download the sample code, KafkaAPIClient, by executing the command: git clone https://github.com/dawudr/KafkaAPIClient.git. Compile the code and create a fat JAR with the command: mvn clean compile assembly:single. Start the consumer: java -cp target/KafkaAPIClient-1.0-SNAPSHOT-jar-with-dependencies.jar com.spnotes.kafka.simple.Consumer test group1. 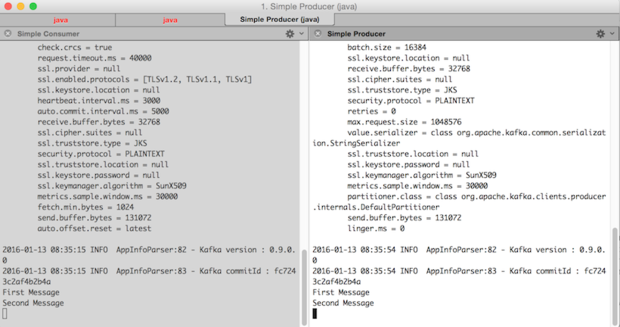 Start the producer: java -cp target/KafkaAPIClient-1.0-SNAPSHOT-jar-with-dependencies.jar com.spnotes.kafka.simple.Producer test. Enter a message in the producer console and check to see whether that message appears in the consumer. Try a few messages. Type exit in the consumer and producer consoles to close them.